“I don’t think ‘God Bless America’ rang true for Guthrie,” said folk artist Mark Dvorak who will pay tribute to Guthrie on Sunday, February 24 at 2:00 pm at the St. Charles Library. After coming home to New York in 1940, Guthrie finished his song with a new title, “This Land Is Your Land,” and it became one of America’s most famous folk anthems. Dvorak will be sure to include “This Land” in the February 24 program. “It’s a very fitting date to celebrate Woody as he completed the song on February 23,” said the singer who has followed in the musical footsteps of Guthrie for "nearly my whole life." 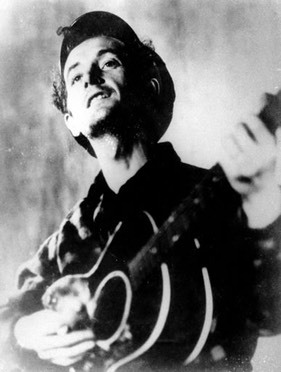 Dvorak’s program “The Life & Songs of Woody Guthrie” was adapted from various sources including old LPs, and an earlier script he developed from Guthrie’s vast collection of novels, biographies, essays and newspaper columns. “The main feature of course are Woody’s timeless songs,” said Dvorak. He lived a pretty tough life, but through it all he kept writing and he kept singing. Chicago’s Mark Dvorak has been active on the faculty of the Old Town School of Folk Music for over thirty years where he is artist-in-residence. The Chicago Tribune calls him “masterful,” and the Fox Valley Folk Festival describes him as “a living archive of song and style. In 2012 WFMT 98.7 fm named Dvorak Chicago’s “official troubadour. The St. Charles Library is located at One S. 6th Avenue. For more information contact the Library at 630 584 0076 or online at www.scpld.org. For more information visit Mark Dvorak on line at www.markdvorak.com.